The Family (and Frog!) Haggadah! 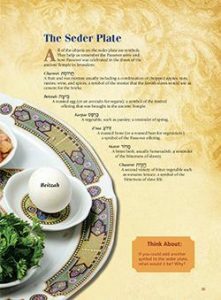 Pass on your timeless heritage while creating new seder traditions that you and your family will look forward to repeating year after year. The frog in this Haggadah has a clear-cut case of ADHD — but one that is entertaining and makes for lighthearted fun. “The Family (and Frog!) 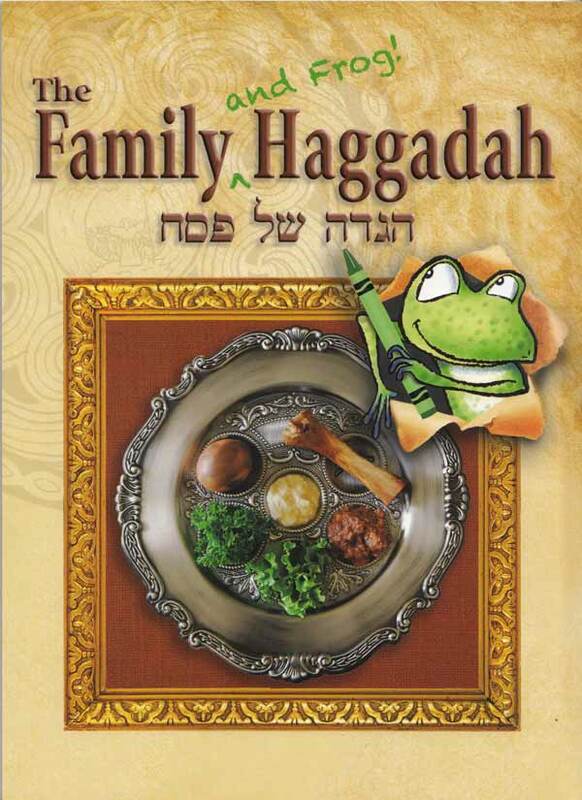 Haggadah,” published in February by Springfield-based Behrman House, is not a pediatric version of the Haggadah, but rather one that children, and bored adults, can enjoy at the seder. Frog, a 5-year-old cartoon character developed by New Jersey children’s author and ventriloquist Karen Rostoker-Gruber, jumps onto every spread with silly puns, quips, and questions. He gets distracted by flies that turn out to be locusts (think the ten Plagues). And he’d like more grape juice, please. And for families who have adopted new customs, you don’t need to search your basement or Passover boxes for the sheet Aunt Susie created with the reading for Kos Miriam. It’s right there on a spread next to Elijah’s Cup, with reference to the first usage of a Miriam’s Cup at a seder in 1989, thanks to some research done for the Haggadah by Jewish historian Jonathan Sarna. On a recent visit to Rostoker-Gruber’s home in Branchburg, Frog, the puppet based on the character in the Haggadah, was eager to chat with a visitor about his favorite color (purple), his favorite part of the seder (the Four Questions), and why he likes visiting with kids in schools around the area (because they’re funny). A wisecracking frog takes center stage in this kid-friendly Haggadah that is a complete guide to a fun-filled, informative, abbreviated seder that’s designed to be 30 minutes to an hour. 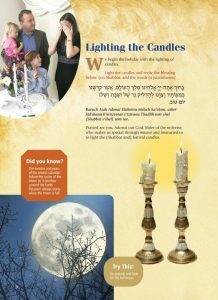 The lively Haggadah, filled with photographs and illustrations, begins with a seder checklist and candle-lighting prayers and guides families through the mainstays of the seder, from the Passover story, to the Ten Plagues to welcoming Elijah the Prophet. 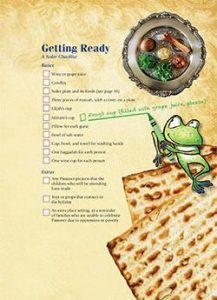 Songs go from the traditional favorite “Dayenu” to “Take Me Out to the Seder.” An entertaining cartoon frog appears throughout with jokes and funny comments (“Hold on! I brought my hopmonica!”) that are sure to bring giggles and keep kids engaged. The Family (and Frog!) Haggadah is a fun take on the traditional telling of the Passover story. 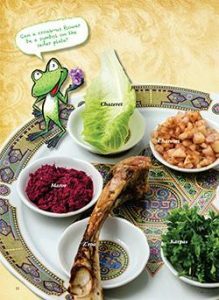 With lists to help participants prepare for the seder and activities to engage all ages, not to mention a cute illustrated frog, children, young and old, and their families will enjoy this Haggadah. Thoughtfully, the authors chose to use a frog as a symbol of transformation. Just as a frog changes from a tadpole to an amphibian, during Passover we share the story of how the Israelite slaves were transformed into a nation. Throughout the book, “Frog,” pops up on the pages with silly puns, interesting activities and cute games. For example, while searching for chameitz, the unleavened products Jews are supposed to dispose of before the start of the holiday, the illustrated Frog proclaims, “I found some toadst.” He also introduces “Game Time,” including puzzles and word scrambles (with answers in the back). Additionally, there are boxes encouraging participants to “Think About” or “Try This” and “Did You Know?” The extension activities are thought provoking on many levels. 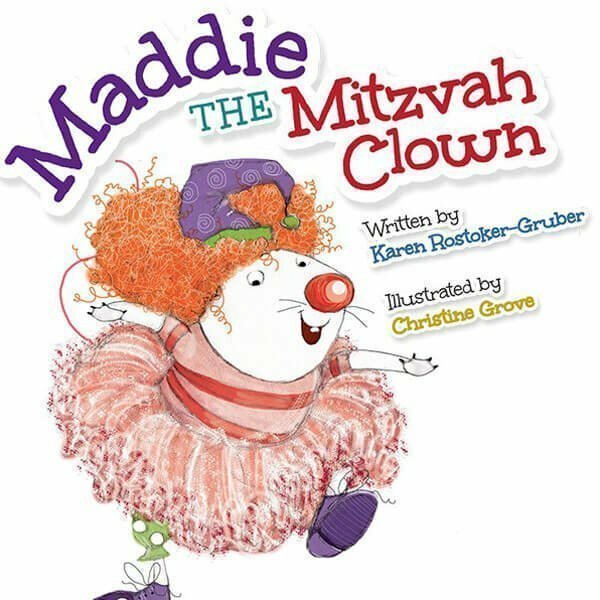 In addition to the spunky Frog illustrations, this Haggadah includes all sorts of images relating to Passover, from historical reproductions to cute contemporary puppets representing Passover symbols. 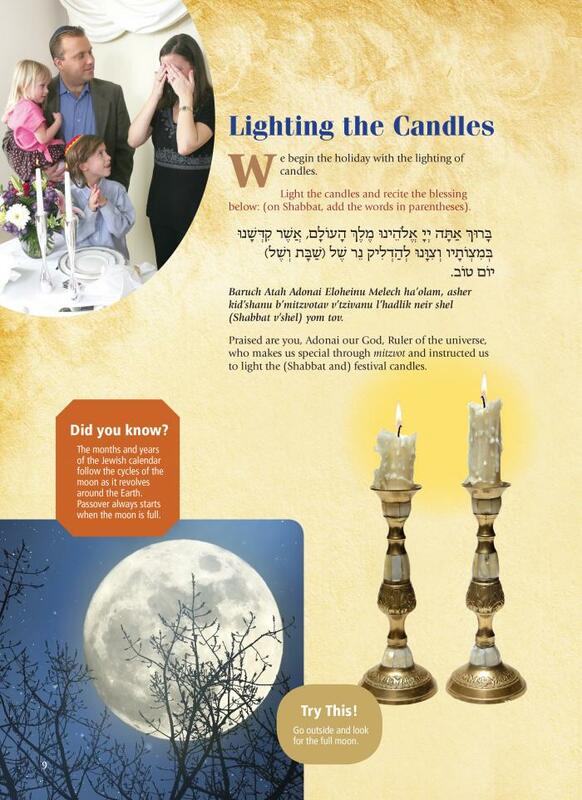 The only concern about this Haggadah is the usefulness of one extension activity, a “Try This!” activity. “Take turns passing around a mirror, and have participants look into it and visualize themselves as a slave.” Despite the connection to the tradition of using a mirror as an educational device for children to emphasize the concept that we are supposed to see ourselves as participants in the Jewish people’s liberation from slavery, this activity seems to minimize the slave experience and may seem disrespectful. However, it would be easy enough to skip it. Overall, The Family (and Frog!) 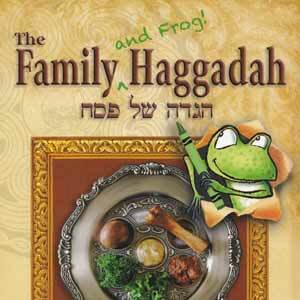 Haggadah would be a fun and engaging book to use at a family seder. Highly recommended for family use.